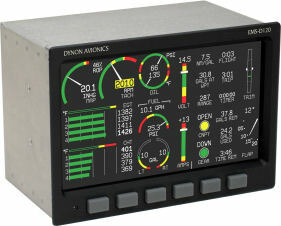 Dynon began shipping its new EMS-D120 on February 10, 2006. Priced only $300 over the smaller EMS-D10, it is $100's to $1000's less than comparable engine monitors. The low price and feature set represent a great value that is rapidly gaining acceptance in the marketplace. Dynon fully expects this will become a very popular addition to those already purchasing its EFIS-D100 due to the matching style, Dynon Smart Avionics Bus (DSAB) connection capability, and excellent value.